Hello everyone! Welcome back to another exciting installment of Exigo Insights. Today we’ll be discussing using a built-in Windows Server Feature that can help protect your file shares against all those harmful ransomware attacks out there. Let’s get started. The face of malware has changed over recent years and it’s safe to say that it’s become an industry like any other. Your data, and it’s importance to you, has a value and it’s one that people are only to keen to capitalize on. With ransomware such as CryptoLocker and Locky, this is something that’s become all too easy. In your organization you’ll have several tools in your arsenal which can be put to good use – mail filtering, gateway AV, web filtering, but one which you really should be making use of is the File Screening feature of your Windows servers. This allows you to build rulesets to report on, or block, files on your server. The File Server Resource Manager role provides many features. File screening, in particular, can be used to help mitigate damage from a ransomware attack. With file screening, file servers can be configured to perform real time auditing on all shares for any files that become modified to any known ransomware extensions. 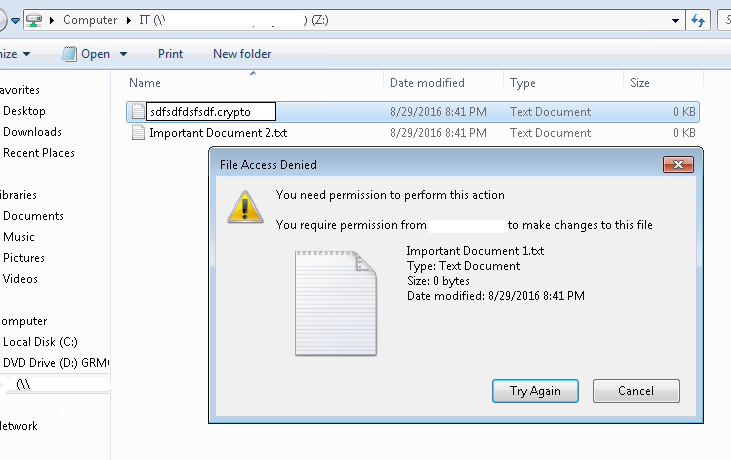 In the event of a user getting infected with ransomware, the file screen will detect the modification of the files and deny that user access to the file shares, preventing them from damaging any other files. This can save hours of downtime and clean up. 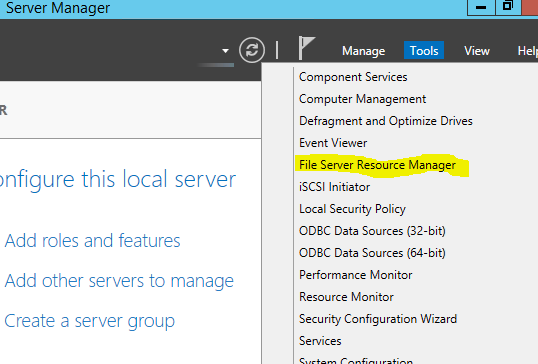 Installs the file server resource manager role if it is not installed. 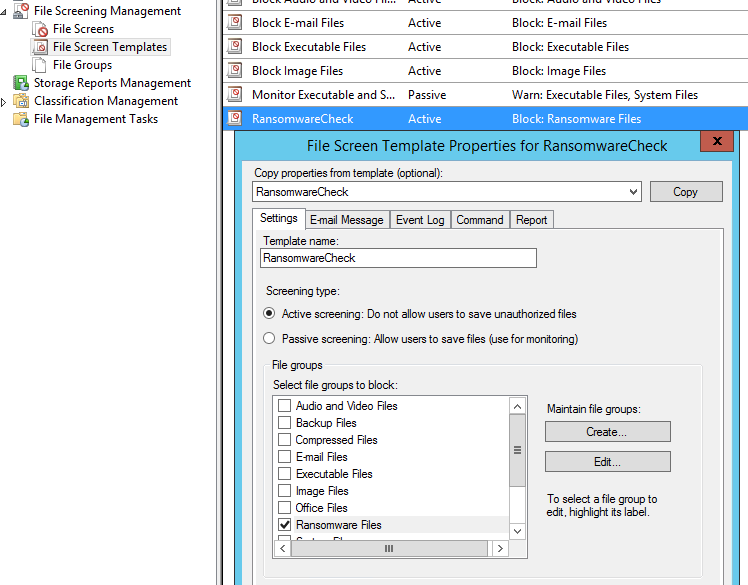 Configures file server resource manager to screen for known ransomware file extensions. 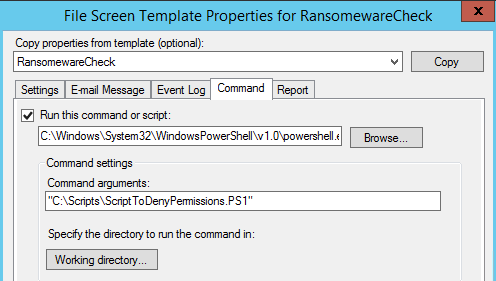 Configures the file screen to execute a script whenever a file is modified to a known ransomware extension. 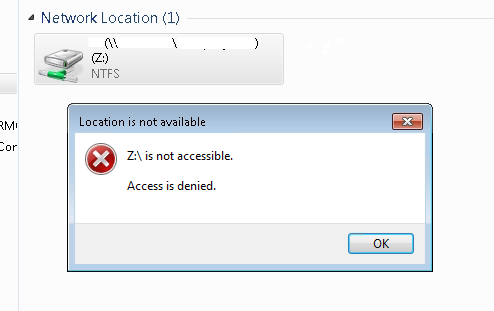 The script then blocks SMB share access to all shared files on the file server and sends an email message to whatever email specified. 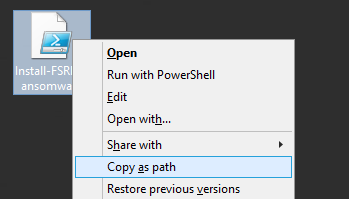 Windows Server 2012 – in order to use the cmdlet that blocks SMB share access. Mail Relay Server – Used to configure email alert. You will want to do your due diligence on making sure the extensions being screened are kept up to date, you can easily edit the file group and add in the extensions at any time. 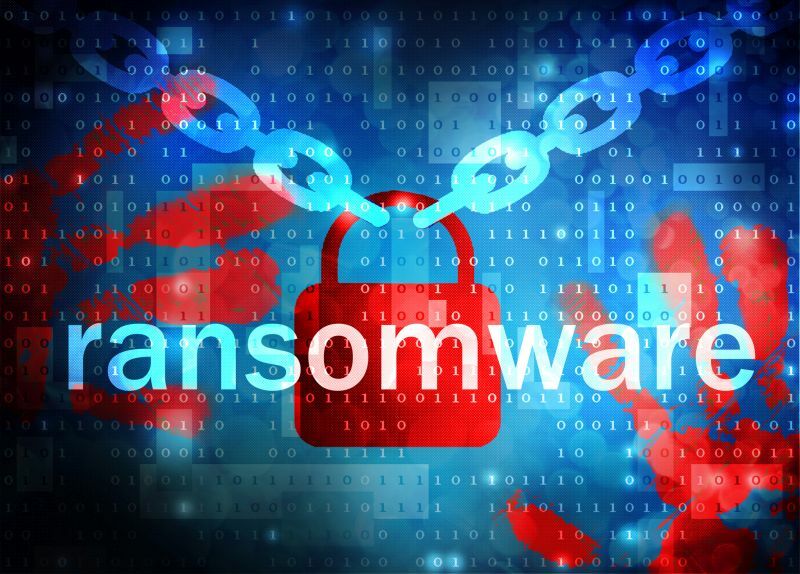 Tripwire has been doing an amazing job at producing security awareness posts that include the most recently discovered ransomware flavors and the extensions they use. Check out their most recent post here. This is great way to protect your organizations data by mitigating the damage done during a ransomware attack. Also, it is free which makes it even better.